Camilla is the Princess of Wales, and when Prince Charles becomes King, Camilla will be Queen, unless parliament decides otherwise — which it won’t. This excessive coyness about the unfortunate Camilla’s titles stems from The Firm’s belief, whether or not well founded, that public opinion would not be able to stomach the assumption by Camilla of the title “Princess of Wales” which in the eyes of much of the world irretrievably belongs to the late and now sainted Diana, the Prince of Wales’s first wife. Similarly, the nation, still supposedly grieving for Diana, is thought to be unwilling to accept the idea that when her husband becomes King, the woman who succeeded — some would say supplanted — her, Camilla, should become Queen. Hence the fancy titles devised for her: Duchess of Cornwall, eventually to be Princess Consort. But Charles’s agonised hesitation over the answer to the question whether Camilla would one day be Queen reveals that, as generally supposed, he hopes she will. And why not? All this flies in the face of reality. As the wife of the Princess Prince of Wales, and in the absence of legislation by parliament to the contrary, Camilla is the Princess of Wales, whatever she has been told to call herself. And if and when her husband becomes King, assuming that Camilla is still married to him at the time, as the King’s wife Camilla will indeed become Queen — not Queen regnant like Queen Elizabeth II, who reigns in her own right, but Queen consort as wife of a reigning King. The only way of preventing this happening would be by passing an Act of Parliament declaring that on Charles’s ascent to the throne, Camilla shall not become Queen. Such a law, which would require the consent of and possibly parallel legislation by the 15 other countries (plus the Cook Islands) of which the UK’s monarch is also the head of state, is clearly inconceivable. No wonder Prince Charles was so comically flustered when asked that seemingly innocuous question. Had Rory Bremner caricatured the heir to the throne in such a way, we would all have said that he had gone over the top. By pretending that the plain facts are not facts but what the royal family, with the connivance of successive British governments, wants them to be, all because of their fear of public opinion and their continuing terror of Diana’s menacing shade, the royals have got themselves into a right old muddle. Camilla, Princess of Wales and Duchess of Cornwall, seems a perfectly unobjectionable lady doing her job, such as it is, with considerable grace. When (and if) she becomes Queen, there seems no possible reason why she should not be formally recognised as such; indeed, to pretend that she is not the Queen when she manifestly is, will be to humiliate her even more than by the insulting refusal to recognise her now as Princess of Wales. Cowardice of this order will do much more damage to the standing and survivability of Britain’s monarchy than a robust acceptance of reality. At a time when the livelihoods and homes of several millions of Britons are under threat from the exaggeration and manipulation of a manageable economic and fiscal problem by a group of ruthless ideologues (i.e. H M government), the question of the precise titles of a middle-aged woman married to a vaguely eccentric prince may justifiably be regarded as light relief, just as the forthcoming nuptials of the prince’s son and heir, greeted on camera by the prince in question with a spectacular lack of enthusiasm, can be seen as a moderately welcome distraction from the gritty reality of Cameron’s, Clegg’s and Osborne’s Britain. Let us enjoy it while it lasts. Please see comment by Phil, below, to whom thanks for pointing out my typo! Update, 20 November 2010: I have added a detailed separate comment below in reply to the interesting questions raised by Pete Kercher: please see http://www.barder.com/2978/comment-page-1#comment-95491. Is that really so, Brian? By that token, would it not have required an Act of Parliament to stop Philip from becoming Prince Consort, as the precedent was set by Victoria and Albert? As we now, he is not in fact Prince Consort, but only a Royal Duke. On the other hand, none of the queens non-regnant since Victoria has ever been a Queen Consort, so I do believe that it is more likelyto require an Act to *make* Camilla into a Queen Consort or a Princess Consort or whatever, rather than to prevent it. On the other hand, I believe there is a precedent (if George IV really did marry Mrs Fitzherbert) for the wife of a king regnant to remain as she was, if her marriage is morganatic. On my understanding, a royal marriage is morganatic if it is understood either that any offspring will not inherit the throne, or that there will be no offspring. Charles’ second marriage seems to fit the bill. That was certainly the case when Louis XIV married Mme de Maintenon, while the first was the case when the archduke Franz Ferdinand married Sophie Chotek. On another point, this sort of thing is a matter for constitutional law, which in the British system is notoriously capable of escaping the confines of the need for parliamentary legislation, relying heavly on the development of convention. As such, it is in fact not impossible that Camilla be given some second-rate title. Living outside Britain, I have no knowledge of how well she is doing her job, but where I agree with you is that it does all appear to be rather squallid and unroyally demeaning. I’m not surprised that the old man shows scanty enthusiasm for his son’s wedding… I read that he is going to have to foot the bill himself! Brian writes: Thank you for this, Pete. As the answers to your questions, while being I think definitive, are necessarily fairly lengthy, I am putting them in a new comment, below. Is the Government still as mesmerised by the spectre of Diana as a bird by a snake, and is her cult really as active – prayers, visions, secret shrines, etc.? I was never a Diana fan; she seemed an empty-headed night-clubbing piece, presumably approved as a royal bride for her apparent virginity, her lack of interest in politics, and her absence of intellectual qualities that might put her in-laws at a disadvantage. She did earn merit by being willing to meet people with Aids and by her stance against land-mines, but she blew it socially after the divorce by consorting with kiss-and-tell jerks and Levantine playboys. 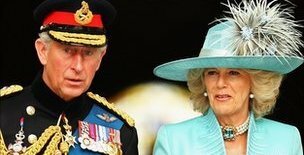 The wife of a king is historically the queen, and is so regarded by the general population, and when the time comes we should all refer to Camilla as queen, whatever other label the powers-that-be attempt to pin on her. Maybe in another hundred years! Brian writes: Thank you for pointing out this Freudian typo — now hastily corrected! In his comment above, Pete Kercher questions my fundamental assertion that in the absence of legislation to the contrary, the wife of the Prince of Wales is legally the Princess of Wales, and if she is still married to Prince Charles when he becomes king, she will legally become queen, whatever alternative titles we may be invited to use for her. Pete’s analogy with the title of the Duke of Ediburgh as husband of a reigning queen (i.e. a queen who reigns in her own right, not a queen only by virtue of being married to a king) is not valid: a man’s title is not automatically affected by being married to a woman who acquires or already has a title of any kind. Thus when Mrs Snooks is given a life peerage and becomes Baroness Snooks (and thus Lady Snooks), her unfortunate husband remains plain Mr Snooks. The position of a married woman is different. When Mr Snooks is knighted and becomes Sir Fred Snooks, his wife automatically becomes Lady Snooks. This, although discriminatory and unfair to men with distinguished wives, is a settled principle of English (and I suspect other UK) law — see the quotation below, and its footnote. Morganatic marriages, by which a wife is legally married but does not acquire any titles by virtue of her marriage, and in which the couple’s children don’t inherit their father’s titles, play no part in English practice. King Edward VIII suggested a morganatic marriage to Mrs Simpson as a possible solution to the problems created by Establishment (especially Church) objections to the idea of a divorced woman becoming queen (hear any echoes? ), but the proposal was rejected by the then prime minister, Stanley Baldwin, and by the whole Cabinet, which would have had to initiate legal action to enable the marriage to be a morganatic one. It seems quite possible that the controversy over Mrs Simpson, which of course led directly to the abdication of the king and arguably the biggest crisis to have rocked the British monarchy since 30 January 1649, is one of the factors that has scared the Establishment into trying to evade the issue of another divorced woman becoming queen — even though in the present case, her husband, the future king, has also been divorced, whereas King Edward VIII had not. A further point not mentioned in my post is the issue of whether, when Prince Charles becomes king, Camilla as his wife (and therefore as queen) will be crowned with him in the coronation ceremony, as for example Queen Elizabeth (later the Queen Mother) was crowned as part of the coronation of King George VI. Camilla will certainly be entitled to be crowned with her husband, the future king: yet if the Establishment still hopes to preserve the fiction that she won’t be queen but only something called the “Princess Consort”, crowning her would plainly be inappropriate. Perhaps a dawning realisation of this insuperable objection to the moth-eaten scenario still nominally favoured by the Establishment contributed to Prince Charles’s evident reluctance, when asked the direct question by his American interviewer, to toe the official line that Camilla won’t become queen when he becomes king. To crown or not to crown, that is the question! The concept of morganatic marriage has never clearly existed in any part of the United Kingdom. All four of Elizabeth II’s children have married people of non-royal status, with no effect on the order of succession. Wives of British princes are entitled to use the feminine form of their husbands’ peerage and hereditary titles. Camilla, second wife of Charles, Prince of Wales, legally holds the title “Princess of Wales”, but at the time that the engagement was announced, it was declared that she would be known by the title “Duchess of Cornwall” (derived from one of the other titles her husband held as heir apparent) in deference, it has been reported, to public feelings about the title’s previous holder, the Prince’s first wife Diana. It was simultaneously stated that upon her husband’s accession to the throne, it is intended that she be known as “Princess Consort” rather than ‘Queen’, although as the King’s wife she would legally be Queen. The use of these lower titles does not denote a morganatic marriage. …The marriage of King Edward VIII and Wallis Simpson was not to be morganatic, although Edward had proposed this expediency to Prime Minister Stanley Baldwin, who rejected the idea after consultations with the governments of the Dominions. …Another marriage which might arguably be regarded as morganatic was between John of Gaunt and Katherine Swynford. When they married after co-habiting for several years all children born previously were subsequently legitimated by Act of Parliament. King Henry IV later declared that they could not inherit the crown, but it is not clear that he had the right to do this. This marriage was important, as King Henry VII was descended from it, but Parliament declared that he was king by “right of conquest”, so some issues remained unresolved. The Royal Marriages Act of 1772 made it illegal for all persons born into the British royal family to marry without the permission of the Sovereign, and any marriage contracted without the Sovereign’s consent was considered illegal and invalid. This led to several prominent cases of British princes who had gone through marriage ceremonies, and who cohabited with their partners as if married, but whose relationships were not legally recognised. As a result, their partners and children (the latter considered illegitimate) held no titles, and had no succession rights. This differs from morganatic marriages, which are considered legally valid. A good reasoning, Brian, and a good quote about morganatic marriage: I was gearing up to quote Katherine Swynford and Henry VII’s descent from it through Margaret Beaufort, then I came across Parliament’s decree that he had won the throne by “right of conquest”. Lawyers knew how to make a simple situation complicated even 500 and more years ago! My bold indicates my doubt. In Albert’s case, his status as Prince Consort was hotly debated and seen as a departure from the norm: it entitled him to certain powers of representation of the queen, which she insisted on his having. George of Denmark had not enjoyed any power of that kind and was not Prince Consort. I suspect the reason is that the English still had very bad memories of King Philip, Mary Tudors’ wife, who was indeed King Consort of England, not Prince Consort, as evidenced by the Charter that hung in the foyer of my school, which had been refounded by Mary and Philip. Brian writes: Thanks again. I’m not going to die in the last ditch over the Duke of Edinburgh’s (Prince Philip’s) titles. I think it boils down to the difference between being a prince consort (lower case) as a matter of fact, and having the formal title of Prince Consort (capital letters) formally bestowed. The title of royal Prince was formally bestowed on the Duke of Edinburgh because he was and is the husband, or consort, of the Queen, not because he inherited the title, or the right to it, at birth. He’s a consort-type royal Prince, not a born one. None of this affects the key points at issue: Camilla, Duchess of Cornwall, has that title because she is married to Charles, Duke of Cornwall: and Camilla is also Camilla, Princess of Wales, because she is married to Charles, Prince of Wales. When Charles becomes King, Camilla, as his wife, will become Queen. We may be invited to pretend otherwise, just as we are invited to pretend that Camilla is not the Princess of Wales. But those ill-judged invitations can’t change the facts. Time to stop pretending? But pretence is such a wonderful thing. Starting with Victoria – or Victoria as marketed by Disraeli – the whole power of the monarchy has been based on illusion. Rational people try hard to deny the power of illusion – but it is very real. The “placebo effect” is one example, another more prosaic, is “summer time” – all we do by advancing the clock one hour is kid the whole country into getting out of bed earlier. Always staring the truth in the face is a very austere business. It might be good for the soul, but tends to make life very uncomfortable. The Royal Family cannot be judged by normal rules, or normal standards of behaviour, because the whole construct is so abnormal. This is what Wallis Simpson never realised – she just thought of Edward as another very ruch man who could do what he liked with what he owned. And the fact he was (going to be) King meant that he should be able to do whatever he wanted. It was not the case then, and is not the case now. Brian writes: Thank you for this, Tim. You echo Bagehot’s famous warning, in reference to the gradual ordinarification of the royal family, against “letting daylight in on magic”. I see the case for the royals keeping a certain distance from the rest of us in the interests of preserving their mystique, what’s left of it; but I can’t see any purpose or benefit, still less any contribution to royal mystique, in trying to persuade the nation that the wife of the Prince of Wales is not the Princess of Wales, when she obviously is; or that when her husband becomes king, she won’t become queen, when she obviously will. These are cowardly evasions, attempts to hoodwink us, out of a terror of the wrath of the tabloids, and I can’t see them as examples of comforting romantic illusion in the sense in which you use the word. Nor does it seem to me that any discomfort would be involved in giving the present Princess of Wales the recognition of her present and likely future status, a recognition to which she is surely entitled. — as T S Eliot sagely remarked. But Camilla’s present and future titles strike me as bits of reality that most of us should be able to bear with a reasonable amount of equanimity. PS: I strongly agree about the absurd illusion involved in changing the clocks for Summer Time. If people or institutions such as schools want to get up and start work an hour earlier in the summer, there’s nothing to stop them, and no rational need to pretend that when the sun is at its zenith it isn’t 12 noon, when obviously it is. But that’s quite a long way from the Princess (whom God protect) of Wales. No need for ditches, Brian, as I agree with you wholeheartedly. But Philip is a Prince by birth (Prince of Greece), not by British intervention, Parliamentary or otherwise. Brian writes: Thank you once again, Pete. As to Prince Philip’s princely status, in Britain he was generally, but not invariably, accorded the title only after being made a prince of the UK etc. by the Queen. For the avoidance of doubt, and without I hope taking the whole pantomime more seriously than it warrants, here is a shortish history of his titular adventures. By letters patent of Nov. 19, 1947 Lt Sir Philip Mountbatten was granted the style of Royal Highness, and he was created Duke of Edinburgh the following day. He was in the anomalous position of being a Royal Highness but not a Prince, although the normal association of the two styles led to some confusion on the matter. Garter stated that “I believe he remains a Prince of Greece and Denmark though naturalized here.” (Garter, 19 Dec 1947, LCO 6/3559). Letters patent of Oct. 22, 1948 granted the style of Royal Highness to the children of his marriage to Princess Elizabeth. In the text, he is styled “His Royal Highness Prince Philip Duke of Edinburgh”. In the Regency Act 1953, and in the birth registration of Princess Anne, he is styled “His Royal Highness Philip, Duke of Edinburgh”. At the time of this birth, the General Register Office consulted the Home Office on the proper style that he should receive, and they proposed “His Royal Highness Prince Philip”; but George VI amended himself the proposed entry and replaced it with “His Royal Highness Philip, Duke of Edinburgh” (see the letter from H. Austin Strutt, 28 Feb 1955, LCO 6/3677). In 1954 Queen Elizabeth II proposed that her husband be created “Prince of the Commonwealth”. This did not meet the approval of the cabinet: the Prime Minister did not find the title “impressive”, and it was thought that other Commonwealth governments, which would have had to be consulted, might oppose it. The alternatives of “Prince Consort” and “Prince Royal” were rejected by the Queen. Another proposal, “His Royal Highness the Prince”, and she seemed to approve of it, but the matter was not pursued (perhaps because of Churchill’s resignation a few weeks later). The matter came up again in February 1957, prompted in part by an article by P.Wykeham-Bourne in The Evening Standard. This time, it was proposed that he be made a “Prince of the United Kingdom of Great Britain and Northern Ireland and Her other Realms and Territories” (a remarkably clumsy formulation: whose realms and territories?). The last six words were dropped, again because of concern about the assent of other Commonwealth governments. In the end, the letters patent of Feb. 22, 1957 styled him “Prince of the United Kingdom of Great Britain and Northern Ireland” in the letters patent. Separately, the Gazette announcement declared the Queen’s will and pleasure that “he shall henceforth be known as His Royal Highness The Prince Philip, Duke of Edinburgh”. It is notable that this declaration was not made in the letters patent themselves, only in the Gazette announcement. You mention Bagehot’s famous warning against “letting daylight in on magic”. Some of us think letting daylight in on magic’s not such a bad idea. Tim’s “all we do by advancing the clock one hour is kid the whole country into getting out of bed earlier,” is a bit of a caricature. All we actually do is agree to observe a different standard time. Brian writes: John, I have reservations on both your characteristically mischievous points. First, I see nothing remotely “magical” about the Establishment’s refusal to acknowledge the present or future status and titles of Camilla, Princess of Wales, although I’m all for letting some daylight in on that refusal, which indeed was the purpose of my original post. Secondly, I don’t recall anyone asking me whether I “agree” to reset my clocks once a year to make them tell the wrong time. I have never agreed to behave in such a ridiculous way, but I’m forced to do it anyway. Time is an absolute, governed by the behaviour of the earth in relation to the sun, and that can’t be changed by Act of Parliament or even by the agreement of the citizens, even if that were to be sought and received (which it isn’t). There is of course a perfectly simple solution to this – although it won’t happen. Pass an Act that on, the demise of the present Queen, the United Kingdom becomes a republic and changes its own title to Great Britain. Mr and Mrs Schleswig-Holstein-Sonderberg-Gottorp, father and son can then live in perfect obscurity for the rest of their days at thief* own expense. PS: *sorry for the typo, a slight freudian slip in view of the way in which the royals acquired their money however. Brian writes: Thank you for this. I have considerable sympathy with the overall thrust of your comment, but with two reservations. (1) I’m afraid the solution you propose would be anything but “perfectly simple”. The monarchy is so comprehensively integrated into every part of our constitution, traditions and culture that disentangling it would be a massive task in purely practical terms, leaving aside the extent to which it would be enormously divisive and indeed strongly resisted in powerful and other quarters. Perfectly simple it would emphatically not be. (2) You imply that the royal family is not genuinely British but actually German. This is simply wrong. If you want to insist that those citizens of our country who have a great-great-grandparent born outside the UK are not truly British, you are going to deny Britishness to a colossal proportion — perhaps even a majority — of your compatriots (incidentally including me). The implication that the loyalty of all such people is in doubt because they are essentially foreigners is surely not one that you seriously intend — at least I hope you don’t. Personally I’m proud of my Polish-Jewish and German-Lutheran ancestry (if you go back far enough) and I’m every bit as British as you, however inbred your origins — assuming that you’re British at all. When Kate Middleton marries her Prince next year she will become HRH Princess William, not HRH Princess Catherine as reported by most newspapers. The Queen can avert universal confusion by following precedent and bestowing a Dukedom, or even a more lowly Earldom, on her grandson. Then Kate will be HRH the Duchess, or Countess, of Fairyland. William’s mother was never Princess Diana. She was Diana, Princess of Wales, with or without the HRH. Prince Philip relinquished his birth rank as a Prince of Greece and Denmark when he acquired British nationality in March 1947. On the eve of his marriage to Princess Elizabeth in November 1947 he was granted the title of HRH Duke of Edinburgh by his father-in-law, King George VI. It was not until 1957 that he was given the royal rank of Prince by his wife, Queen for five years. Only then could he once again be called Prince Philip. And, in 1820, George IV tried to have a Bill passed through parliament which would have dissolved his marriage and therefore deprived his estranged wife, Caroline of Brunswick, of her right to be crowned as Queen. The Bill was passed by the Lords with a narrow majority. But Caroline had such popular support in the country that there seemed no possibility of the bill passing through the Commons and it was dropped. The Coronation of George IV is remembered for the unseemly farce as his wife tried to gain entrance to the Abbey and her coronation. But it might also be remembered for the convention, ignored in this case, that the wife of a King is deemed to be rightfully Queen. Brian writes: Thank you for this, JB. The prospect of Kate becoming Her Royal Highness Princess William is entrancing. Let’s hope that public awareness of this splendid title will be allowed to sink in for a year or two before the Queen spoils it by making the happy couple a Duke and Duchess of somewhere or other. Brian, knuckles duly rapped, but I was indirectly trying to make two points – the first we are getting ourselves exercised by the title that Prince Charles’s wife is going to be called once the present Queen dies and he succeeds and yet as recent history shows, the Royal Family have been remarkably flexible with their titles and indeed their surnames; the second that I can’t really see how the two sons of the Prince of Wales can actually call themselves Wales as a surname (particularly when we see William having to be dragged to Cardiff for an international when it’s patently obvious he’s rather be at Twickenham). I am Scottish by descent and residence if not birth; republican by instinct. Brian writes: Thanks, Richard: I don’t have any quarrel with either of those points. If I were Welsh, I would feel pretty fed up with the pretence that the present Prince and Princess of Wales and the sons of the Prince of Wales have some special commitment to Wales. The royals tend to make much more of their Scottish connections, admittedly for reasonably concrete reasons. But no-one now alive, royal or commoner, can be blamed for the centuries-old tradition that the male heir to the throne becomes the Prince of Wales, and the faintly absurd Wales surname I suppose follows from that. What does everyone think of Bishop Pete? I think you’re out of date about time, Brian, but lets leave that for another day. Brian writes: Thanks again. Personally I have no views on this Bishop, whose opinion of the engagement of the Prince and his fiancée is surely of no possible interest to anyone except the circulation manager of the Daily Mail. Being “out of date about time” sounds like an oxymoron, time being (obviously) timeless. Eh? Charles is a Duke of several places and Earl of several more. William just has to have a courtesy title from one or more of those: viscount this or that or something. I know he’s not styled as such but I’m sure if they rootle around in the titular attic they’re find he’s already got a title or two. @Tim Worstall: You would surely be right if Charles and William were any old Peers but I suspect that different customs apply to Royals. For example, the current Dukes of Gloucester and Kent are HRH Princes because they are the grandsons of a monarch (George V). During the lifetime of their fathers, sons of the King, they did not use the courtesy titles appropriate to the heir to a Dukedom. Instead they were respectively known as HRH Prince Edward of Kent and HRH Prince Richard of Gloucester. However, their heirs are using the subsidiary titles because the royal rank and style does not extend beyond grandchildren of monarchs. So the heir to the Duke of Kent is known as The Earl of St Andrews and his son is Baron Downpatrick. The Duke of Gloucester’s heir is the Earl of Ulster and his son is Baron Culloden. Incidentally the Earl of Ulster as an army officer was able to see active service in Kosovo without any tabloid attention presumably because nobody knew who he was. Prince Charles. as male heir apparent, became Duke of Cornwall when his mother became Queen and Prince William will inherit that Dukedom when Charles becomes King. Charles, as you rightly say, has other titles. He is Duke of Rothesay and Earl of Carrick but, as I understand it, these peerages are the inheritance of the heir to the Scottish Crown and therefore cannot be handed out to junior family members. Prince Charles does use those titles on occasion in Scotland as no doubt William will when he too inherits them. He and his wife will have plenty of titles to choose from in future. The problem is now. An exact precedent for Prince William’s situation is Prince Albert Victor, grandson of Queen Victoria and heir to the Prince of Wales who became Edward VII, in other words the heir to the heir. Queen Victoria made Prince Albert Victor Duke of Clarence and Avondale. His early death of course led the way to George V succeeding Edward VII as King, an outcome which is usually regarded as a Good Thing. Because of Albert Victor’s reputation it is unlikely that the Dukedom of Clarence will be used again for an heir but the precedent of a dukedom is there to be followed. The Queen of course broke with precedent when she made Prince Edward an Earl on his marriage rather than giving him the customary Dukedom for a Royal Prince. But I seem to remember that she also announced that he would succeed to the Dukedom of Edinburgh when his father dies. Perfectly happy with the idea that the royal dukedoms don’t work as the others, with subsidiary titles. Parliament in 1469 confirmed the restriction of the Dukedom to the heir apparent to the Scotttish Crown and Carrick and Renfrew are governed by the same Act. Thus Prince William will have to wait until he is heir apparent to the throne before he can use any of Prince Charles’s titles and if he needs a title other than Prince, The Queen will have to invent one. Fair enough, willing to believe. Although I’d still insist that subsidiary titles would be easier to invent than new ones…..